Have you heard many records lately that feel just at home when the sun is warm as when the snowflakes are about to form? Not many I’d wager but ‘California Trail’ is about to seamlessly fill that gap in your music collection. Adam & Darcie are a husband and wife team so it seems particularly apt that their vocals should complement each other so irresistibly. Both take on lead vocals at various points throughout but it is rare to find one voice operating unaccompanied. This is an album full of lush harmonies, delicate (and often intricate) instrumentation and a running order that never breaks the beautifully soothing flow. As the world around gets increasingly besotted by electro retro giddiness Adam & Darcie’s sophomore proves to be a calming antidote. 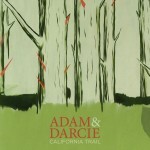 ‘California Trail’ is getting its debut on indiecater, something that makes us feel very proud. We hope you like it as much as we do. We recently asked Adam and Darcie to give us the lowdown on their writing and recording process and here’s what they said. Darcie: I’m very melody driven. Adam can construct a beautiful guitar part but until it has a strong melody that I can’t resist singing, it’s like a faceless person. Often, when I write a song I start with the melody. Adam: For me it’s usually a matter of picking up a guitar and letting my fingers do whatever they want until something is sparked. After being moulded a while you start to see a song come to life. It’s always exciting to see what they’re going to be like, like they have a personality of they’re own. It’s also a great release in that you can express, comment, lament, celebrate, etc. whatever is going on in and around you in an almost subconscious way. Darcie: I usually saunter in, tell Adam to push the button, do a take, and then go back to my knitting. Truthfully, Adam is responsible for the flesh and bones of every song. Sometimes it takes a really long time because I’ll keep cracking up about a bum note or get defensive when Adam tells me I need another take. My parts usually get laid down 3/4 of the way into a song and Adam will then write a few more cool instrumentations over them. Adam: At home. In the living room. The bedroom, the bathroom, the kitchen, etc. In the spaces we live. As a result you can occasionally hear a chair squeak, or on our new album, the sound of our son in the background… they’re very subtle, and few and far between but when they’re there it doesn’t bother me. Tenacious T, Scottish Friction, Lito Music, Das Klienicum, The Velvet Rut. Previous Previous post: The World Cup Goes Indie!